Latham Robert Tiver is a lifelong resident of Burlington County. After growing up in Tabernacle and attending Shawnee High School, Latham went through the apprenticeship program and secured a position with the International Union of Operating Engineers Local 825. As a community leader in Southampton, Tiver served on Township Committee and was appointed Deputy Mayor in 2014. He is a leader of the Southampton Township Recreation Association which provides opportunities for the youth of Southampton to participate in healthy, competitive sports. His own children are involved in Southampton sports and he makes time to help coach their teams. Tiver has also worked with the State’s “Safe Routes to School” program; he has assisted in bringing grants to Southampton that ensure that children have safe walking and bicycling routes to school. Tiver joined the Freeholder Board in 2016. 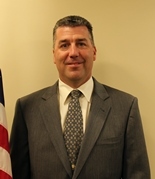 As Freeholder, Tiver serves as liaison to the Courts and the Medical Examiner.